Air navigation standards. Wing structure features a single spar torque box connected to fuselage via three pin attachments to each half wing. Fuselage structure is a steel tubing framework for cabin area high protection and semi-monococque light alloy tail to support empennage. Ease of inspection; immediate access for servicing that is efficient and inexpensive at the same time. 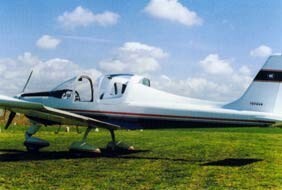 Particular attention is devoted to fuselage aerodynamics with the adoption of a composite fairing that elegantly and efficiently joins the cabin with the vertical tail. Specially studied wheel fairing are mounted on each wheel to reduce parasite drag. Landing light is located inside engine cowling in correspondence of nose wheel strut. Engine cowling is made up two parts and allows for quick and complete opening. Fuel tanks are integral part of the wing structure and feature 35 litre capacity per each half wing. Fuel feed is via an engine driven pump and is backed-up for emergency by an electric pump. The wide cabin (1,10 m) features two side by side seats that can be adjusted via sliding rail stops, a large baggage compartment is located behind seats. Cabin access is through a canopy that slides towards rear of aircraft overlapping tail fairing consequently allowing unrestricted opening even with aircraft in flight. The wide windshield offers a complete view unhindered by structural elements, while large side windows allow for excellent visibility. The entirely moving tailplane permits superior control and a high degree of stick free stability, moving surfaces feature mass balancing. Landing gear components have been thoroughly tested and feature a clear record of safety and efficiency. The main landing gear consists of special steel springs with 5.00-5 size tires and hydraulically actuated disc brakes, while nose gear features a steerable wheel with rubber shock. instrument panel meets General Aviation standards both in size and quality allowing for installation of a wide variety of flight instrumentation inclusive of IFR, engine controls and com/nav apparatus. 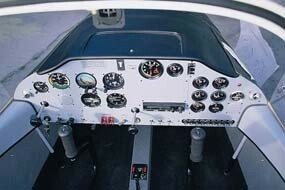 Flight controls are traditional type with dual stick, dual rudder pedals and dual throttle knobs on dashboard. Longitudinal trim and electrical flap controls with position indicators are also located on dashboard. Cabin ventilation is via adjustable air vents fed via buried scoops.